WhenToHelp Lite is set to let helpers trade or pick up shifts "at will" without needing coordinator approval. If you have a paid subscription you have the option to require coordinator approval for all trade and pick up requests (which can be changed in the SETTINGS>Global Helper Permissions page). 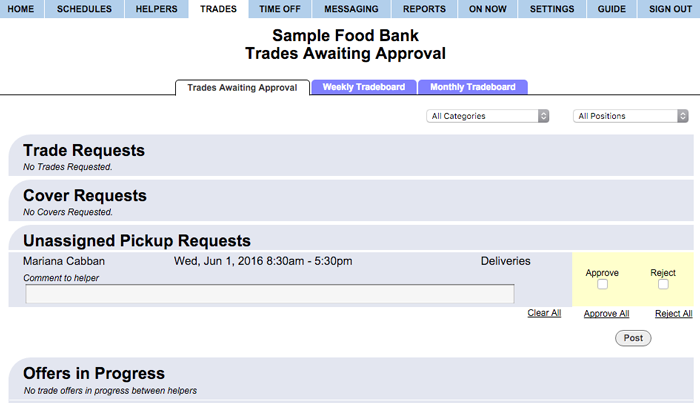 If you require Coordinator approval for trades and/or pickups, the Trades>Trades Awaiting Approval page will show you the shifts awaiting Coordinator Approval and also the shifts that are in process between helpers and an awaiting helper to agree. How helpers can use the Tradeboard is controlled from the SETTINGS>Global Helper Permissions page. The bottom section shows you the offers that are still pending between helpers, where one helper has asked to trade or pickup a shift but it is still awaiting approval by the other helper. Once they agree, you will then see that request listed in the top portion of the page, and you can approve or reject it. You also can see which shifts are on the Tradeboard or pending Coordinator Approval on the By Helper Schedule View, where a Tradeboard icon will appear next to the shift.